This ain’t yo Mama’s banana bread. This banana bread with Oreo Biscoff Spread is so amazing, and so much better than the original that I had no choice but to post it on my Mom’s birthday since she’s so stinking amazing. In fact, this banana bread is so sinfully delicious you may want to hide in the closet just to devour it. (Let’s be honest, if you’re a parent you probably already hide in the closet or at least hide your treats around the house because heaven knows that as soon as you take a bite you’ll have a little one on your leg begging for some, a bite, or at my house, “I try it, Mom?”)So Mom, because you are the most patient, kind, accepting, giving, and humble person that I know, and because I know that I wore you out more than most of the other kids in the fam, here’s to you, a dessert to hide in the closet and devour all on your own because you deserve it. Thank you for passing on the love of hot french fries and a desire to love and teach my own children. 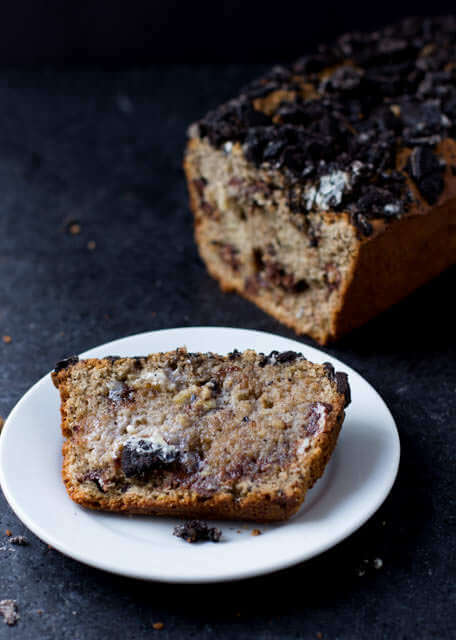 This oreo biscoff banana bread is about to change your world, and I’d even go as far as to say that your overall happiness may improve as well. The bread is easy to make with our favorite Biscoff Oreo Spread (peel yourselves up off the floor. You heard right, oreos and Biscoff blended in a jar of love) and Land O’ Lakes butter that makes the bread itself tender and moist, stuffed full of two kinds of chocolate chips, and then topped with an oreo crumble. I die. This is one of those times that it’s perfectly acceptable to not share, shove the kids aside (nicely), pound your way up the stairs and into your closet to hide the bread so that it may be devoured promptly at 8:15 pm when the kiddos are nestled into their beds and husbands are turning on, The Walking Dead. And since you brought the subject, what the heck is up with, The Walking Dead? Everyone and their mom seems to be watching the show, but I just cannot bring myself to hop on board. It seems so creepy! So fill me in folks, are you watching and if so, how do you sleep at night? Like, literally how are you sleeping and not up with nightmares? It looks like it’s pretty gory! Yes, I’m a wimp and I realize that, but is the show really that good? 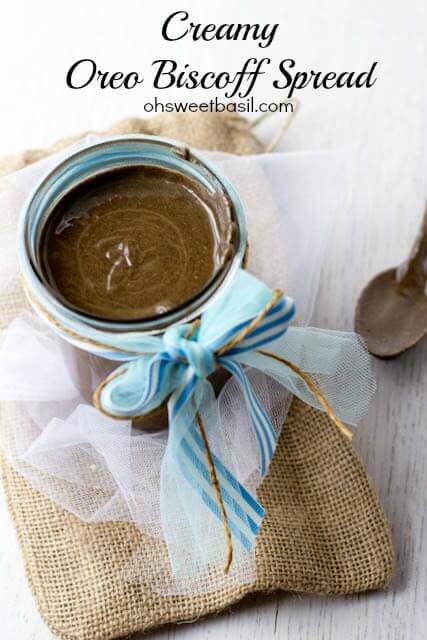 Here’s the link to the oreo biscoff spread in case you missed it in the recipe. Anyway, back to the deliciousness, if you’re smart like me you’ll add a smear of butter to the hot, squishy, oh my gosh I can’t even stand it!!! Why am I writing this at 11:30 at night? I’m so ridiculously hungry now! Ok, let me regroup, if you’re smart you’ll add a smear of butter to the hot bread, if you’re like my hubby I guess you can skip it, but just know that you officially aren’t coo’. 😉 It’s always all about the dairy, and you’re probably going to want a tall glass of milk to go with this. Just click the link to see why dairy should be a part of your life too. Biscoff is a European spread made from Lotus Biscoff Cookies. It is a good alternative to nut butters. What Does Biscoff Taste Like? Biscoff has a slight carmely flavor. 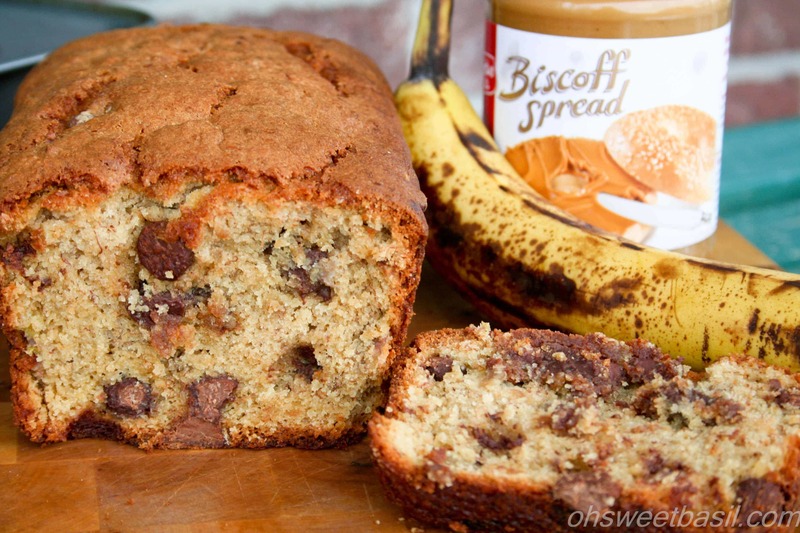 Do You Need Overripe Bananas To Make Banana Bread? Overripe bananas are easier to mash, which makes them easier to blend into the batter, and they are sweeter. But, you can still get quite a good banana bread from fully ripe, but not overripe, bananas. Heat the oven to 350 degrees. Spray a small to medium sized loaf pan with nonstick spray. In a medium bowl, mix the flour, baking soda, cream of tartar, and salt. Set aside. In a glass measuring cup add the peeled bananas and smash with a fork. I prefer to smash mine, not puree them for better texture. In the bowl of a standing mixer, add the butter, oreo biscoff spread and sugar Mix on medium speed until completely combined and smooth, add the eggs and mix on medium speed to combine. Bring both the flour mixture and smashed banana to the mixer. Add a little flour and mix, and then add a little banana and mix again. Continue going back and forth until both ingredients have been used. Add the chocolate chips and stir them in with a wooden spoon. Pour the mixture into a loaf pan, and top with crushed oreos. Place in the oven for 50-60 minutes tenting with foil the last 10-12 minutes to help keep a lighter color. Remove from the oven when the bread sounds hollow. Ours always takes 58-60 minutes, but this will depend on your oven. You may omit the crumble topping if you prefer this to be more like a basic banana bread. I do not use black bananas as the very freckly, turning brown ones seem to come out with better results. 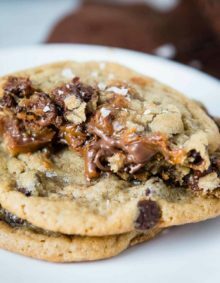 Pingback: 20 Oreo Cookie Recipes That Are Next-Level Genius - How to do everything! 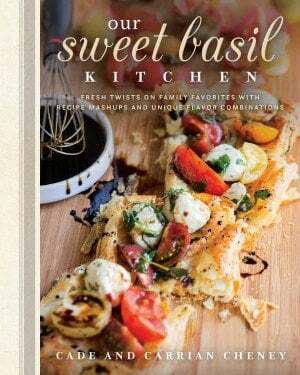 This is one treat I am going to make over and over again! I can smell it already. Dangit, I wish I had some. Now I need to go buy bananas just to ripen on the counter for bread. Can I tell you that I am drooling over this right now! Love and Pinned! oh goodness, I hardly shared at all! Hmm When do you add the eggs? Kevin, you’re a life saver! I corrected the recipe. Thanks for noticing my mistake, and you add the eggs after combining the butter, biscoff mixture. Thanks! Holy! 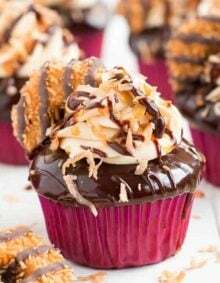 Wow, this is too delicious looking 🙂 my husband would die if I made this! This bread sounds amazing! Biscoff, oreos and chocolate chips?! Yes, I’ll take the whole loaf and hide in the closet! Um, Carrian? Pinch me because I think I’m dreaming! First, a homemade Oreo Biscoff spread?! And then putting it into the most fantastic banana bread my eyes ever saw? Amazing!! This looks AMAZING, Carrian! Many of my faves in one loaf of deliciousness! Thanks Robyn! Am I going to see you at any conferences this year? Yum. This bread looks awesome! Thanks, Emily! Good luck on your Koiugn Amann! I’ve been following your site for years! oh, Erin! Good luck and you wont regret the 72 hour challenge or digging into this when you’re done. OMG! That looks crazy good. 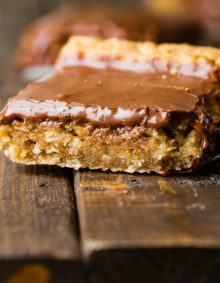 I’m totally obsessed with Biscoff. The inside of the bread looks so moist and decadent and amazing! Isn’t it the best stuff ever?! This banana bread is kinda ridiculous! I’ve never seen that Oreo spread! Is it in the PB and J aisle? I’ll have to look for it. I have a freezer full over over ripe bananas that I rescued from the fruit bowl. Guess I just have to make this, right?! So I’m a huge TV junkie. I have it on all day long while I cook, bake and clean. I LOVE LOVE LOVE Walking Dead. And vampire diaries. And pretty much everything else. I also adore BISCOFF and OREOS! ooooohhhhhh I can’t wait to meet you and hear if we have any shows in common. 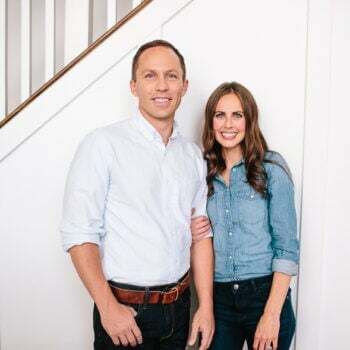 I pretty much never have the tv on during the day, but we have a few favorite shows we sometimes turn on in the evening. Seriously, there are a few that I’m so hooked on! I love you, you brilliant, beautiful woman, for bringing this bread into the world. 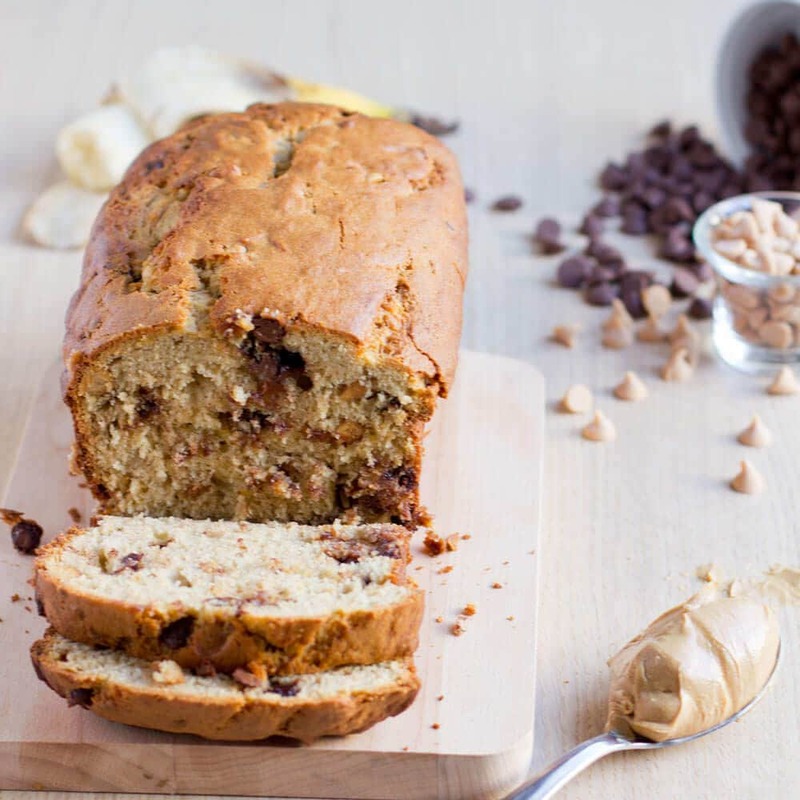 Holy moly, that’s the most mouthwatering banana bread ever! Looks so good, Carrian! And as for the Walking Dead… I mean, I wouldn’t watch it if my hubby wasn’t into it. But it does have a great plot and I like following the story of all it! 🙂 Worth a watch if you have a pillow to mush your face into for the gory bits! Excellent post. I was checking cunoinuotsly this blog and I am impressed! Extremely useful info specifically the last part I care for such info a lot. I was seeking this particular info for a long time. Thank you and good luck. I love chocolate and bananas. So I’m sure I’d love this bread. OMG would you think bad of me if I told you I thought a dirty word when I saw that first pic? This is so freaking fabulous. hahaha, I think you’re wonderful and I’m totally cracking up over here. Oh wow yum, your banana bread looks so delicious! thank you!! It tastes just as yummy as it looks. I love every part of this loaf! That looks downright dangerous. Maybe I’ll make it for the neighbors and just steal a slice ;). Oh, and The Walking Dead, I watched 2 minutes of it and I don’t get it. TONS of my friends watch it. I do, however, love vampire diaries. everyone loooooves the vampires. haha. Oreo’s and Biscoff? Girl, you are genius. I love this! 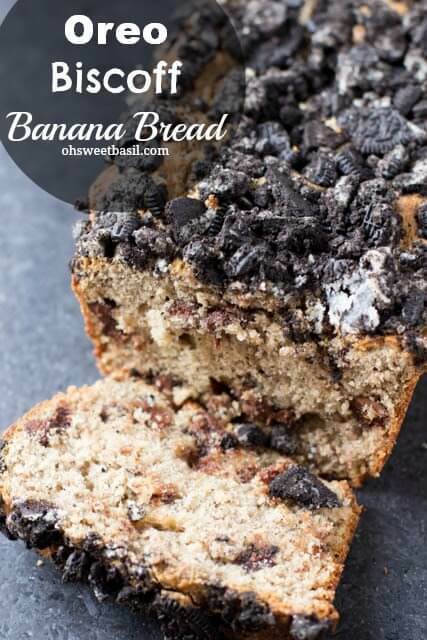 You just put Oreo cookies in banana bread. I just…you…what? Is this real life? hahaha, you’re the best. It’s killer, no joke. right? It got a little crazy in my house that day. Ha! I can’t watch The Walking Dead unless it’s in he middle of the afternoon with tons of people around me! It is scary! 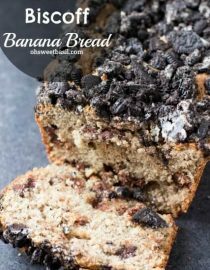 But this oreo biscoff banana bread, is far from scary! I would like to shove this in my face! Amazing, loving those chunky Oreo bits!! Aren’t they the best? Oh oreos, how I love thee. Holy wow! That is a whole lot of delicious looking banana bread! 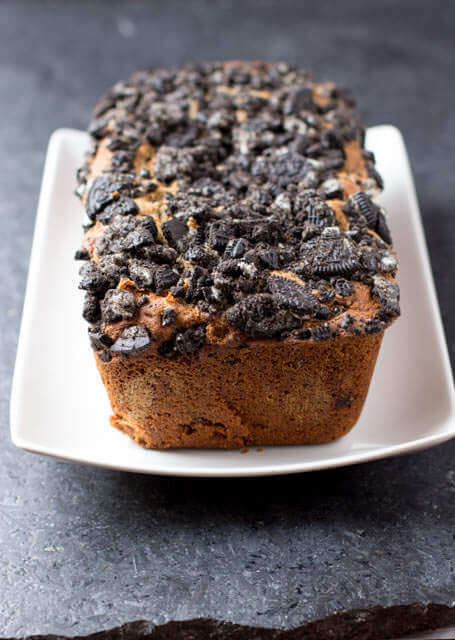 Any banana bread is my favorite, but then you went and added oreos! WOW! Wish you were here to share a slice!